The release comes in a small case with a b/w-xeroxed insert. 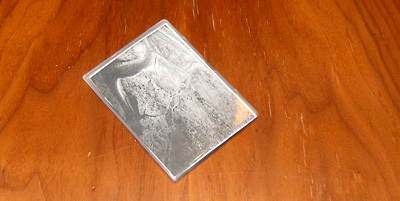 One side shows a grainy photograph of some river, the backside has the name of the project and the title of the release handwritten. The disc itself houses a single 3:48 mintue track entitled „Nature knows…“. However, it is allmost two tracks as at 1:59 there is a short break after which the track continues but the sounds have shifted a little. The track starts with a great sound of pulsating, throbbing, distorted synth-pulses which form a rythmic pattern. On top are heavily processed vocals which have a decent amount of distortion- and flanger-sounds. They somehow remind me of the typical Steel Hook Prostheses vocalsound, though the overall sounds of both projects have not much im common. After the short break the synth pulses continue as do the vocals, but the pattern has shifted. So it is not really like another track but there is some sort of difference to the first fragment of the track and switching from the first to the second fragment is rather abrupt. The overall feel of the track is highly energetic and quite aggressive. It is hard to label it as harshnoise or sort it in the power-electronics box. Soundwise I‘d say it is pe, but in terms of concept and presentation I‘d put it into the harshnoise-corner. Anyway, more important is the quality of the material and the quality level of the release is really really high. Been listening to it quite a lot since I got the disc and the material still grows on me.